Aneurysms of the left main coronary artery (LMCA) are exceedingly rare clinical entities, encountered incidentally in approximately 0.1% of patients who undergo routine angiography. The majority are atherosclerotic in origin. Other causes include trauma, connective tissue disorders, Kawasaki disease, vasculitis, congenital, mycotic, and idiopathic. The primary complication is myocardial ischemia or infarction, with rupture being rare. We describe herein a 59-year-old male presenting with effort angina whose coronary angiogram revealed LMCA aneurysm. A 43-year-old obese, hypertensive man, presented in emergency department with acute onset of chest pain at rest that radiated to his jaw and left arm associated with profuse sweating. On examination his pulse was 96/minute, blood pressure 190/100 mmHg, respiratory rate-28/minute and temperature -98.4 F. Jugular venous pressure was normal. There was no cyanosis, clubbing, icterus, pallor, or lymphadenopathy. Routine biochemical, renal, and liver function tests were within normal limits. CPK-MB was raised with maximum values of 60U/L. Electrocardiogram showed ST segment depression of 2 mm in anterior precordial leads. Chest skiagram revealed cardiomegaly. Left ventricular apex and upper 1/3 rd of inter ventricular septum were hypokinetic on echocardiogram with left ventricular ejection fraction of 48%. 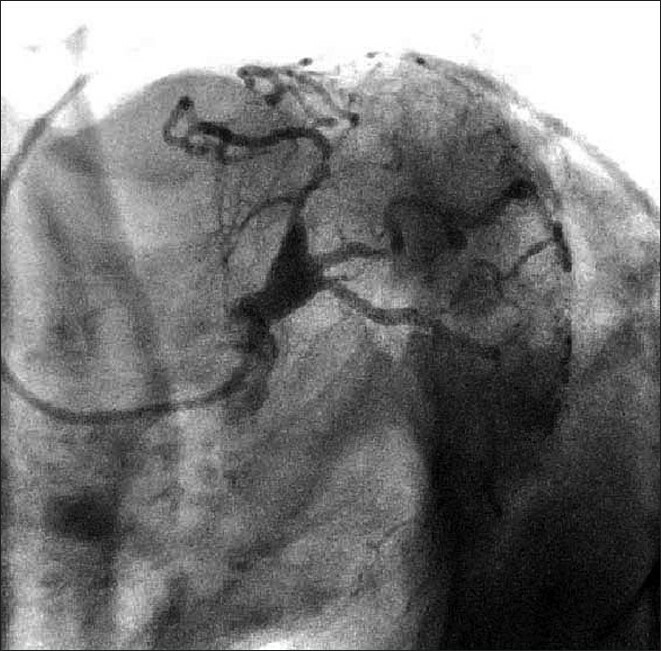 Coronary angiography revealed a fusiform LMCA aneurysm originating at the distal segment 45.7 × 30.6 mm in size [Figure 1] and [Figure 2]. The patient was advised surgery but he refused and was conservatively managed with dual antiplatelets including aspirin 150 mg and clopidogrel 75 mg and anticoagulants. The management of LMCA aneurysm is not well established owing to the rarity and unpredictable natural history. However, these dilated sections of artery are not benign entities because they are subject to spasm, thrombosis and spontaneous dissection and can be a potential cause of myocardial infarction. Surgical management is appropriate in symptomatic patients who have evidence of emboli from the aneurysm to the distal coronary bed, leading to myocardial ischemia. Surgery is also indicated in cases of progressive LMCA enlargement as documented by serial angiographic measurement. The preferred approach for surgical correction of LMCA aneurysm entails proximal and distal end ligation of the aneurysm with bypass of the LAD by means of the left internal mammary artery. Placement of a saphenous vein graft to bypass the left circumflex may also be necessary to adequately perfuse the left ventricle. Patients not managed surgically must nevertheless be monitored very closely and treated with antiplatelet and anticoagulation therapy to prevent thrombus formation within the aneurysm. It is required to follow-up these patients every 3 months. 1. Lima B, Verma SK, Lowee JL. Nonsurgical management of left main coronary artery aneurysm. Tex Heart Inst J 2006;33:376-79. 2. Everett JE, Burkhart HM. 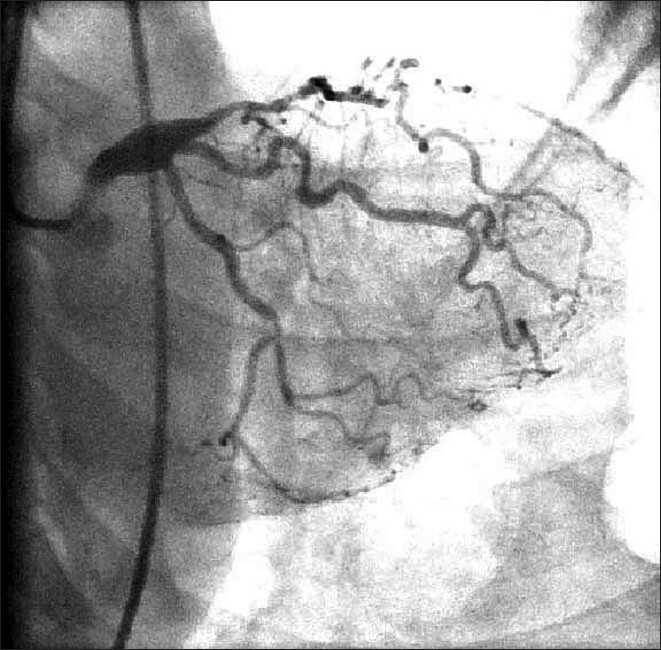 Coronary artery aneurysm: Case Report. J Cardiothorac Surg 2008;3:1749-53. 3. Syed M, Lesch M. Coronary artery aneurysm: A Review. Prog Cardiovasc Dis 1997;40:77-84. 4. Huang CY, Huang CH, Chen JW, Liu TM. Atherosclerotic left main coronary aneurysm. Int J Angiol 2004;13:89-91. 5. Topaz O, Di Sciascio G, Cowley MJ, Goudreau E, Soffer A, Nath A, et al Angiographic features of left main coronary artery aneurysms. Am J Cardiol 1991;67;1139-42. 6. Stabile E, Escolar E, Weigold G, Weissman NJ, Satler LF, Pichard AD, et al. Marked malapposition and aneurysm formation after Sirolimus eluting coronary stent implantation. Circulation 2004;1105:e47-8.